The luteal phase of your cycle is a very important one- it is the phase from ovulation day up to the day that your period returns. The luteal phase is normally around two weeks long,but some women can have phases that are shorter or longer. During the luteal phase, the body starts to produce more progesterone than normal, in order to prepare the body for a potential pregnancy. The progesterone also helps your endometrial lining to thicken, so that it is easier for the egg to implant. 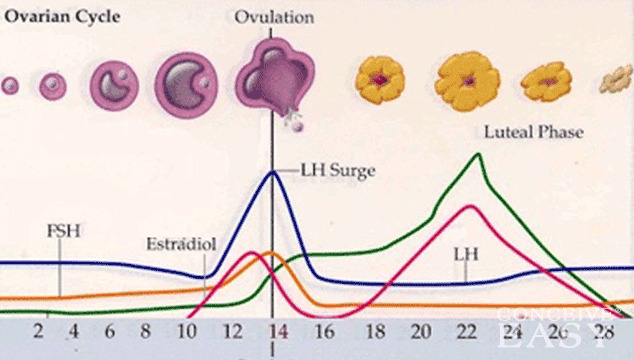 Something that is very important about luteal phases is the length of the luteal phase. As mentioned before, most women have a luteal phase of around two weeks. However, having a luteal phase that is too short can indicate problems. This is because if a luteal phase is less than 12 days, the body doesn’t have enough time to build up progesterone levels. This means that if a woman’s luteal phase is less than 12 days (known as luteal phase defect), the embryo might have problems implanting, and could result in a miscarriage. By charting your basal body temperature or using an over the counter ovulation predictor kit, you can time the number of days from your ovulation day to the day you start your period. This can help you figure out just how long your luteal phase is , and whether or not it is cause for concern. After you ovulate, if the egg becomes fertilized, it will then become a “blastocyst”, which just means fertilized egg. The blastocyst will make contact with the endometrial lining and will attempt to implant. Once the blastocyst implants in the endometrial lining, it becomes an embryo. Sometimes, you will notice a little bit of implantation bleeding as the embryo tries to implant in the lining. After the embryo implants, the placenta will begin to develop. As this happens, the body will begin to produce hCG. This is the hormone that is detected by home pregnancy tests, and until enough hCG is built up in the body, all pregnancy tests will show as negative even if a woman is indeed pregnant. This is why it is important that a woman wait until the first day of her missed period to take a pregnancy test, so that she doesn’t get a false result. As you can see, the luteal phase is a very important part of the menstrual cycle, and lots of important things happen during this time.